My last days in Germany were bitter sweet. I am sad to say bye to all of the friends that I made from all over the world, but also glad to head on my journey home. Sometimes I sit back and think about how I lived in Germany for the past 5 months and I still get shocked every time I think about it. I feel like I just landed to Germany and I am already getting back on a plane to go back to the U.S. this week! I studied at the European Business School in a small country town called Oestrich-Winkel, but I lived in the city of Wiesbaden, which is a 30 minute train ride from Frankfurt. I had the opportunity to live with a German woman, Frau Ley, that did not speak any English whatsoever! At first I thought that I would have trouble adjusting to her culture, language barriers, and not having my own privacy that I am used to, but I am glad that I chose to live with Frau Ley. I am going to hate saying bye to her. Now she is my German grandmother. After 5 months, I now know how to cook authentic German desserts and dinners and can speak almost fluent German. About the German language, most Germans are fluent in English and sometimes you cannot tell that English is not their mother language. I took 2 semesters of German before I arrived, but I feel that it was not enough. The most important phrase to learn is, â€œSprechen Sie Englisch?â€, which means do you speak English. I also took 2 German language courses while my semester abroad. If you do not take any German courses before arriving to Germany, I would definitely suggest you take the German language courses offered at EBS. The class is laid back and enjoyable to learn. It is totally different learning German in the states versus learning it in Germany. You have so much more opportunity to practice it and learn it faster. I spent most of my travels traveling throughout Germany because there is so much to see in just one country, but I also went to London for 1 week and Austria for a weekend. My most favorite trip was to southern Germany. The landscapes were so beautiful and I was able to see so much snow. Traveling throughout Europe was very easy because there were many special deals with various types of transportation, such as bus, train, and flight. I loved to travel with any free time that I had. It is good to keep busy and to see as many different countries that you can. Many students used Ryanair to purchase cheap flight tickets (some even around 10 Euros). I did not purchase tickets from this site because the airport was too far away and was required to buy a bus ticket to the airport, which is 24 Euros round trip. Also, being a EBS student, you will be required to pay around 100 Euros for a student ID card. This card will allow you to travel on all regional trains and buses for free, which was extremely useful. Living in Wiesbaden was nice because I was able to live in the city and the train ride to school was about 20 minutes. However, transportation in this region was not that convenient. There is always a long wait for the train or bus (30 min. to an hour). Also, trains and buses all stop running at different times. Donâ€™t worry about not fitting into the culture and not making any friends. I met 200 international students that were in the same position as me. We had lots of time during the semester to meet up and go on trips together. Saying goodbye to them was so sad because I want to take all of them back to the states with me! This week is my last days in Germany and it is bitter sweet. I am sad to say bye to all of the friends that I made from all over the world, but also glad to head on my journey home. Sometimes I sit back and think about how I lived in Germany for the past 5 months and I still get shocked every time I think about it. I feel like I just landed to Germany and I am already getting back on a plane to go back to the U.S. this week! I studied at the European Business School in a small country town called Hattenheim, but I lived in the city of Wiesbaden, which is a 30 minute train ride from Frankfurt. I had the opportunity to live with a German woman, Frau Ley, that did not speak any English whatsoever! At first I thought that I would have trouble adjusting to her culture, language barriers, and not having my own privacy that I am used to, but I am glad that I chose to live with Frau Ley. I am going to hate saying bye to her. She is like my own Grandmother now. After 5 months, I now know how to cook authentic German desserts and dinners and can speak a lot better German than I did when I arrived. About the German language, most Germans are fluent in English and sometimes you cannot tell that English is not their mother language. I took 2 semesters of German before I arrived, but I feel that it was not enough. The most important phrase to learn is, â€œSprechen Sie Englisch?â€, which means do you speak English. I also took 2 German language courses while my semester abroad. If you do not take any German courses before arriving to Germany, I would definitely suggest you take the German language courses offered at EBS. It is totally different learning German in the states versus learning it in Germany. You have so much more opportunity to practice it and learn it faster. I spent most of my travels traveling throughout Germany because there is so much to see in just one country, but I also went to London for 1 week and Austria for a weekend. My most favorite trip was to southern Germany. The landscapes were so beautiful and I was able to see so much snow. Traveling throughout Europe was very easy because there were many special deals with various types of transportation, such as bus, train, and flight. I loved to travel with any free time that I had. It is good to keep busy and to see as many different countries that you can. Many students used Ryanair to purchase cheap flight tickets (some even around 10 Euros). I did not purchase tickets from this site because the airport was too far away and was required to buy a bus ticket to the airport, which is 24 Euros round trip. Also, being a EBS student, you will be required to pay around 100 Euros for a student ID card. This card will allow you to travel on all regional trains and buses for free, which was extremely useful if you live in Wiesbaden. Living in Wiesbaden was nice because I was able to live in the city and the train ride to school was about 20 minutes. However, transportation in this region was not that convenient. There is always a long wait for the train or bus (30 min. to an hour). Also, trains and buses all stop running at different times. The classes were a lot different than what I am used to at UofL. I would have classes some weeks and then would have a couple of weeks where I did not have any classes. I also would have class from 8 A.M. to 6 P.M. and would not meet again for another 2 months. I had group projects, papers, and presentations in every class and one final examination per class. Since classes are just pass/fail for UofL students, passing at EBS is feasible. Studying abroad is a great way to see different parts of the world and also make friends from all over the globe. This experience also helps with personal growth. I personally, had a difficult time networking, but this study abroad helped me to talk easily among others. Thank you UofL for allowing me to embark on this journey!! The classes were a lot different than what I am used to at UofL. I would have classes some weeks and then would have a couple of weeks where I did not have any classes. I also would have class from 8 A.M. to 6 P.M. and would not meet again for another 2 months. I had group projects, papers, and presentations in every class and one final examination per class. Since classes were just pass/fail for UofL students, passing at EBS is feasible. 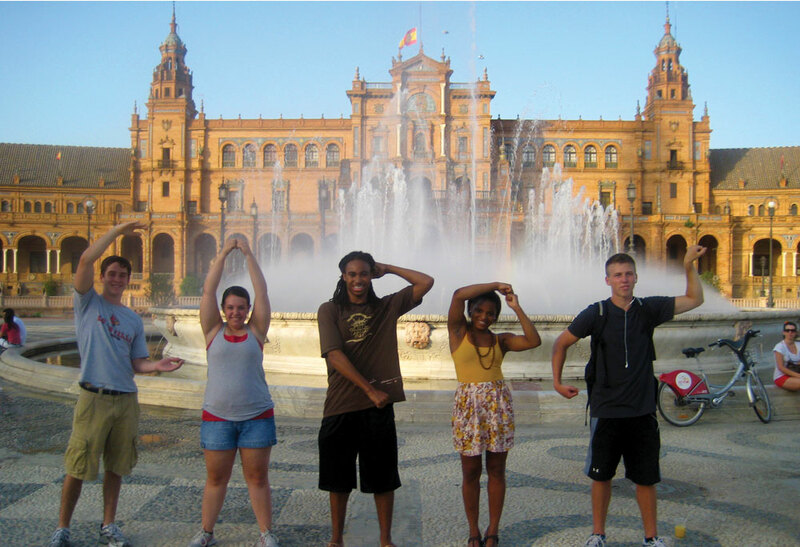 Studying abroad is a great way to see different parts of the world and also make friends from all over the globe. This experience also helps with personal growth. I personally, had a difficult time networking, but this study abroad helped me to talk easily among others. Thank you UofL for allowing me to experience this wonderful opportunity!